The EU Action for Smart Villages initiative was launched in 2017. It argues current rural development policy provides the tools for supporting ‘smart village’ development. Relating to the Rural Development Programme, LEADER and the European Innovation Partnership for Agriculture (EIP-AGRI) are specifically highlighted. Smart villages are rural communities that build on their strengths and assets, while also developing new opportunities. Underpinning this approach is enhancing both traditional and new networks and services through digital, telecommunication technologies, innovations and better use of knowledge. The concept is not prescriptive and acknowledges there are no one size fits all solutions. It is also about much more than digitisation. The concept takes a bigger picture focus and enables a more holistic view of how rural development is taking shape. Rural policies and programmes provide for building blocks to support rural development. The smart villages concept aims to enable local actors to look beyond component parts, assess, plan and take action around how existing assets and future opportunities can come together and join the dots for more balanced, forward looking rural development. 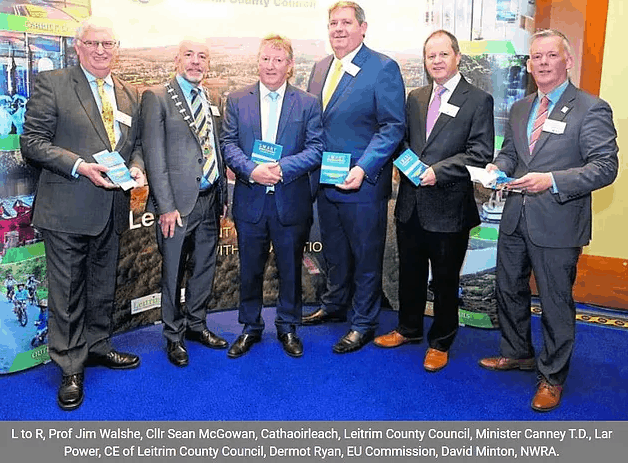 A national conference on Smart Towns and Villages was hosted by Leitrim County Council in Mohill on October 22nd 2018. The National Rural Network (NRN) attended the conference and displayed posters produced by the NRN team at NUI Galway. The conference was attended by Dr Maura Farrell and Dr Shane Conway from the NUI Galway team and Dr Aisling Murtagh from the Irish Rural Link team. Posters showcased work carried out by the NRN in relation to the LEADER Programme 2014-2020. An important part of the conference was setting the scene around how this new conceptual approach is driving rural policy and the opportunities it presents. EU Cabinet member Dermot Ryan outlined how the EU Action for Smart Villages is being taken forward such as through the pilot Smart Eco-Villages project and Thematic Groups. ‘Smart Villages’ is the current sub-theme of the broader European Network for Rural Development’s Thematic Group’s work on ‘Smart and Competitive Rural Areas’. The NRN’s Dr Shane Conway is a member of this group. Dr Stephen Brennan Chief Digital Advisor to the Irish Government outlined how we need to build ‘smart communities’ around three supporting pillars – economic wellbeing, basic skills and physical/mental wellbeing. Speakers highlighted how national policy such as the National Planning Framework and Project 2040 link to the smart villages concept and national policies are focused on building synergies between them which makes collaboration between different bodies important to achieve synergistic benefits. The conference also provided Leitrim with the opportunity to showcase how it is working to advance and apply the concept locally. This covered EU, national, regional and local level policy approaches and actions. Enda Stenson who is rapporteur for the opinion on revitalisation of rural areas through smart villages which was adopted by the European Committee of the Regions in December 2017 discussed his vision for a smart village. The opinion has called for greater action and the development of a targeted, forward looking policy on smart villages. Lar Power CEO of Leitrim County Council discussed how place-making and the partnership model is shaping local development. Mel Gavin of IT Sligo’s Innovation Centre outlined how a range of community driven initiatives have been progressed in Mohill to drive ‘smart’ development such as around energy, enterprise and remote working. Workshops on local smart infrastructure (The Hive Technology Enterprise Centre and the Food Hub) and wider initiatives (Slow Adventure Tourism and SEAI Sustainable Energy Communities) were also held. The conference successfully highlighted a range of issues and opportunities related to smart villages, showcasing progress achieved in the Leitrim context towards developing the concept. The National Rural Network will continue its work with the European Network for Rural Development and broader analysis of the smart villages concept. We are currently developing our 2019 Action Plan and considering how we can integrate the smart villages concept into our actions to improve the quality of implementation of the rural development programme. Want to know more about Smart Villages? Read the European Committee of Regions draft opinion on EU Action for Smart Villages here.